We have been extremely pleased with our experience at Park Slope Schoolhouse. Our child started in the 2’s program and is currently in the 3’s. The facility is beautiful and everyone who works in the school is friendly, professional and wonderful to interact with. There is a high level of communication between the school and parents, the curriculum is excellent and the teachers are warm, loving and work very well with the children. The kids are able to experience so much awesome activity, and there is a nice community of parents as well. I am very grateful that we found this school and would highly recommend it to anyone. Our son has thrived here. Our older daughter is an alum of PSS and our second daughter is about to “graduate” from the Park Slope Schoolhouse. We are so pleased with the care and early education both have received there. The staff is energetic, professional and really engages with each child. The full-day year-round program creates great stability for for kids and provides welcome dependable hours for parents. It’s truly high quality care in a light, modern space. Our daughter Eloise spent her first year at home with a wonderful sitter, someone we loved as part of the family. Like most parents, we were nervous about sending our child into an new, unknown environment, but it was the best decision we could have made. Her time at PSS was life altering. Almost immediately we saw growth in her emotional and verbal abilities. Within her first week, she developed self discipline in areas we didn’t think we could have expected from such a young child. She was able to take on projects and games that were more demanding of her concentration and became much more social and verbal. The environment was loving and engaging, but also structured. She understood what to expect each day at school and what was expected from her. Her development at PSS and the support we received from the entire administration helped bring order to our (at times) chaotic life. It was the best decision we made in our daughter’s early childhood development. Park Slope Schoolhouse gave her an excellent head start and quite possibly spoiled all other schools for us as parents. It is the best. Our older son had the privilege of experiencing the 1’s, 2’s and 3’s class at Park Slope Schoolhouse. Our younger was in the 1’s and 2’s class. Our whole family is so grateful for the school and all it does for our kids. What is not to love? A well run program with experienced, fun, loving, and dedicated teachers and staff. A great facility: cheery, well stocked classrooms, outdoor space, and a wonderful indoor multipurpose room. An amazing set of enrichment activities, like cooking, bilingual music, and yoga. A supportive community for children and parents alike. My kids have grown and thrived at Park Slope Schoolhouse, and we feel great knowing they are so well cared for at school. 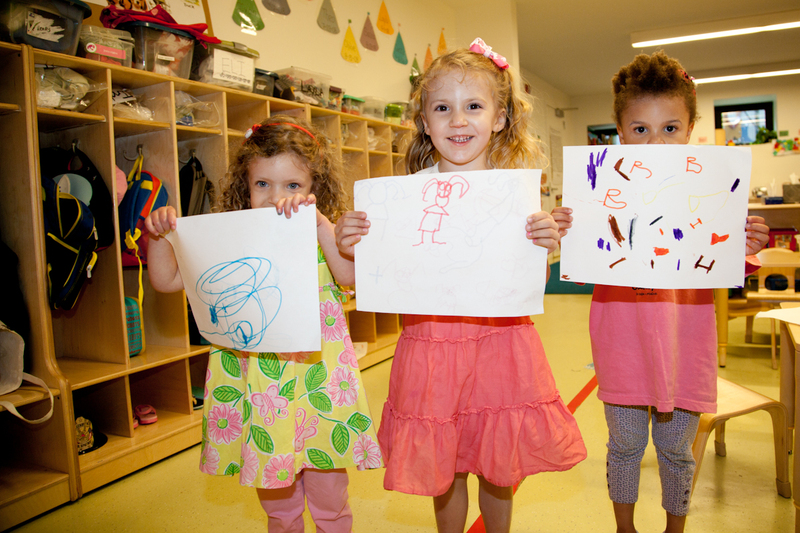 It is well-known that Park Slope Schoolhouse has one of the best early childhood development programs in Brooklyn. PSS employs nurturing, bright, and tireless teachers, who not only have all the right credentials,but are engaged with the children as devoted caregivers. What I find unique is the school’s admissions process as directed by Ashley Davis. I was welcomed from my first visit with a warm and friendly interest in my particular needs as a working parent. Tuition is addressed at the outset in a clear statement of all that PSS provides with one figure for the calendar year. The application process was thorough, but also transparent and efficient, which cut through the confusion and anxiety that can arise when seeking the right school. Joining the PSS community has been a joy! We recently moved to the neighborhood and are so happy that we made the decision to send our daughters to PSS. From the moment we took the tour, we knew it was going to be great…and we were right! They both loved school and all of the new friends they made. Our older daughter is always telling us about her yoga or cooking or painting. We know that she is in great hands every day! The staff is so caring, down-to-earth yet professional and you can see how much they care for the students. It has also been a great way for us to meet new people in the neighborhood and we instantly felt a part of the PSS community. My daughter has attended Park Slope schoolhouse for three years. Since day one, I’ve always felt that she’s been with caring, engaged and nurturing teachers. My daughter is sometimes a bit reserved and the teachers can pick up on this instantly. They have great methods for making all of the students comfortable. I love how welcoming the environment is and most importantly seeing my daughter talk about all of the activities they did at the school. I cannot recommend PSS highly enough. It was a tough decision to consider full-time care but PSS has made it one of the best decisions I’ve made on my daughter’s behalf.